When I was a kid, the local museum sponsored day programs where we’d gather to build kites from sticks and paper, paint them garish colors, then fly them. Kids in Grand Rapids, MI, do something a little more practical: they learn to build snowshoes and birch bark canoes with simple hand tools thanks to two local men, Kevin Finney and Patrick Cronan. “Anybody can do this,” Finney said about the process of shaping raw wood from an ash tree into finished shoes. Before you shake your head in disbelief, keep in mind Finney and Cronan are willing to guide you along. The men are teaching a three-day snowshoe-making workshop […] at Blandford Nature Center, during which participants will build a pair of shoes by hand. A variety of skills will be covered, including selecting and bending wood and making simple and effective Native American-style bindings. A rather silly thing to do with all this global warming. Excuse me while I go shovel some more of that “global warming” off my driveway. i live here and visited the blandford nature center frequently as a child. .
plenty of show here to try them out. Chuck, are you in GR? I am. The only “problem” is they cost $300…. it is a cool idea though. I love sonwshoeing and go out at least a couple of time a week. But then, I walk out my back door and I’m only a hundred yards from National Forest land! We have grandkids up and usually get them involved for a while, but playing Gameboy usually wins out in the end. 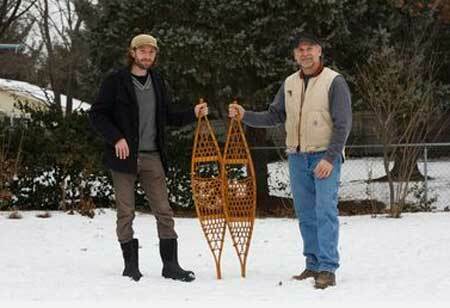 The old wood-type snowshoes are light, quiet and mystical. Winter in the woods is a very special time.